Toss shrimp and HOT HEAD sea salt together in a bowl. Heat 2 teaspoons oil in a large non-stick frying pan over high heat. Cook shrimp, for 3 to 4 minutes or until pink. Transfer to a plate. Cover to keep warm. Meantime, reduce heat to medium-high. Heat 2 teaspoons oil in pan. Add couscous. Cook, stirring, for 30 seconds. Stir in boiling water. Season with additional HOT HEAD to taste. Simmer, covered, stirring occasionally, for 8 to 10 minutes or until couscous is tender and water has absorbed. Transfer to a large plate. Reserve half the orange segments. Cut remaining segments into 1cm pieces. 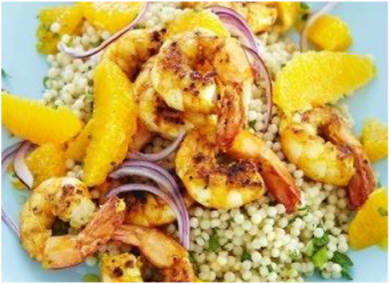 Add chopped orange, lemon rind, lemon juice, cilantro and remaining oil to couscous. Toss gently to coat. Divide mixture between plates. Top with reserved orange segments and shrimp. Finish with freshly sliced red onion.